Digital marketers and SEO operators had been watching with curiosity to known the impact of RankBrain on SEO ever since the latter was introduced as an artificial intelligence algorithm by Google for refining search results. Google deployed rank brain in 2015. The rest is history. Today, RankBrain has become Google’s third most important ranking signal (ranking factor) after content and links. RankBrain is the proof of Google search algorithm embracing machine learning (AI). This really helped Google in gaining a better understanding of the search queries. The SEO wizards have noticed stark variations in SERPs compared to the past. It had defiance of conventions and surprises around the efficacy of keywords. In the past, the entire Google algorithm for SEO was hand-coded. Of course, engineers are still working on the algorithm of Google. But RankBrain has assumed a bigger role in the backend because of its ability to tweak the algorithm on the basis of different contexts. When Google introduced RankBrain algorithm in October 2015 Bloomberg news carried a timely article explaining RankBrain as something that uses artificial intelligence and can change written language into mathematical data called as vectors. 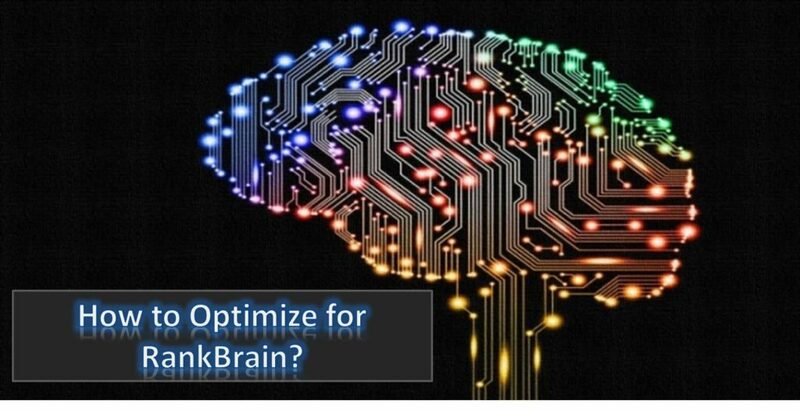 Today RankBrain is the sole Artificial Intelligence used by Google and sorts live results and has cured the frustration of users who had faced the problem of getting results with no worthwhile information except filler content built around keywords. In short, RankBrain works as a processing algorithm offering the best match to a query and can weed out ambiguity on the purpose behind the query while giving best results that will satisfy a searcher. The google search ranking shows the impact of RankBrain’s functionality in evaluating the scope of keyword and ramps up of backlinks,domain authority,content freshness and content length accordingly in the final results. Prior to the arrival of google rankbrain, the top search engine had been scanning millions of pages to trace the exact matching keyword. Rankbrain algorithm has come as a big relief to Google. Confronted with so many digital marketers keywords as queries, Google was facing the problem of understanding the searchers’ intent. To offer accurate and valid results Google had to guess what the searcher is looking for. One example can illustrate the power of Rankbrain algorithm and how google rank brain has reduced the guesswork. But RankBrain has a broader understanding of what is being asked and it will deliver 100 percent accurate results. On the question, what is rank brain rankbrain SEO, the answer lies in the new algorithm’s ability to understand the intent of the searcher. This is done by mixing and matching known keywords with unknown keywords to give a bonanza for results and helps websites with the opportunity to showcase themselves for multiple keywords and in getting a broad range of rankings. Google RankBrain already knows that thousands of searches have happened for “grey console developed by Nintendo.” Consequently, searches for “grey console developed by Nintendo” will see of results about gaming consoles as well. When a searcher wants to know “the grey console developed by Sony,” RankBrain immediately throws in similar results to the keyword that is already known to it from grey console developed by Nintendo. So the results will have the entire spectrum of consoles as a product. For the overly curious, the technology behind rankbrain was a mystery. But a Google blog post published in the past has some clues. It mentions a technology called Word2vec that transforms keywords into concepts. Though the post does not mention RankBrain openly, it is fair to assume that RankBrain also works under similar technologies. As the new age, google search algorithm RankBrain has induced massive quality improvement to SERP as it looks beyond mere keyword-matching. This is done by looking at the big picture in the search by transforming searching terms into concepts than scouting for pages covering that concept. The rank brain also tracks user satisfaction by understanding new keywords thanks to the ability to tweak the algorithm on its own. In other words, RankBrain as the Google algorithm for SEO can show search results that will get maximum liking by the users. In the results, pages liked more by users for the information can expect a better google search ranking as a fall out of the RankBrain perspective. RankBrain takes a serious look at how a user interacts with the search results. It keeps a tab on the “Pogo stick effect” where unsatisfied users hit the “back button” out of sheer frustration at the search results. Google rankbrain will diminish pogo-sticking on a specific result and a popular page will be made easier to find. How to Optimise for RankBrain? RankBrain has also made traditional keyword research an obsolete concept. When Rankbrain algorithm emerged a winner with the flexibility in tweaking keyword, Long Tail Keywords were the worst affected. 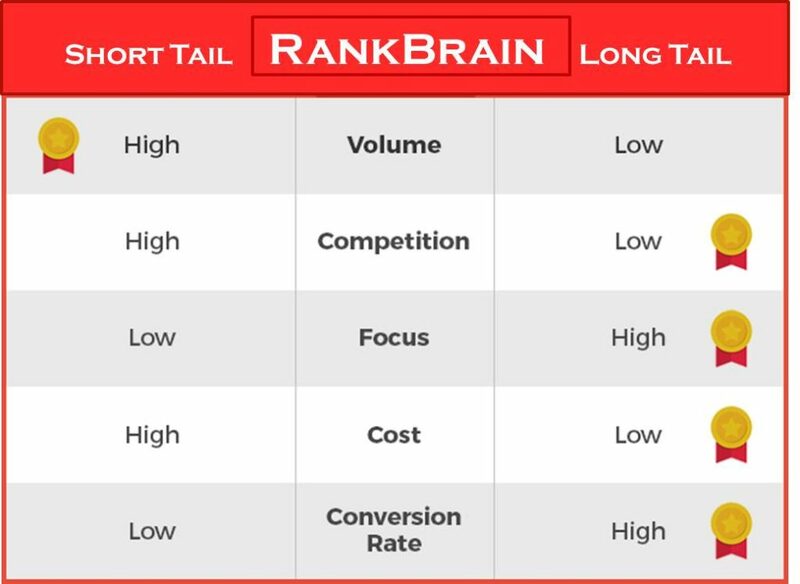 Entrenching Google rank brain has made long tail keywords a thing of the past and crushed the method of having keeping pages for each optimized keywords. So, the practice of having separate pages for “spatula,” “spatulas,” “kitchen spatula,” and “metal spatula” is gone. Today RankBrain understands the above terms refer to the same thing and identical search results are enough for all of them. The situation has made optimizing long tail keywords a time waste. Medium tail keywords are the new kids on the block. To optimize for rankbrain means paying more care to medium tail keywords. What is rank brain will explain why it conjoins different phrases and URLs into a single piece through the deft content incorporation of varied keyword phrases similar to the way humans search and speak. One more benefit is Medium tail keywords command carry more search volume and are not too competitive like the long tail. In optimizing a page around a medium tail keyword RankBrain will get that term ranked for thousands of similar keywords. is learning to work with Google’s new program by making a mindset shift. There are experts suggesting tips to be friendly with Rankbrain. Larry Kim, founder, and CTO of WordStream calls for improvingorganic click-through rates to increase SEO success rate because he thinks “Relevance Score” of the rank brain is almost the same as the Quality Score of AdWords. He also sees RankBrain technology in google search ranking as a variant of erstwhile G-350 technology. This AdWords technology was self-sufficient and never needed any external signals such as links forranking paid search ads. That protocol is now engulfing organic search as well. To stay compatible with the Google algorithm for SEO click-through improvements are necessary via SERP snippets. For that, reworking page titles and meta descriptions echoing the users’ needs is necessary in order to invite the user to click for more. Google rankbrain has also induced the urgency to simplify URLs to add value to Google and expand user experience. Content must target featured snippet positions in search results and must be irresistible to the users and search engines. John Rampton, TechCrunch contributor suggests modeling a website and its content on the basis of domains favored by Google for leveraging the rank braid SEO opportunity. Take the case of the health sector, the favorite of Google in this domain is WebMD.com. This most searchable index is chance for other sites to have a similar structure and be in the “good” camp of Google and reap the spillover benefits. On the other hand, sites resembling a spammy site in the health sector will face the backlash as they are spammy and in the “bad” camp of Google. RankBrain spams websites that carry too many different topics and is without a focal area because it can’t understand who will use such multiple and diverse content. The rising impact of Rankbrain is affecting Keywords. Rankbrain algorithm, according to some industry experts, is the death knell to old-fashioned SEO keywords. 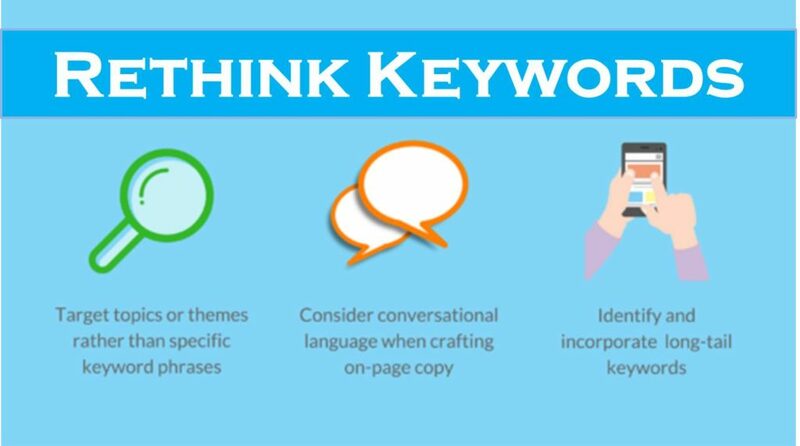 Yulia Khansvyarova, head of digital marketing at SEMrush holds the view that the key to successful SEO in a RankBrain era is changing the approach to keywords. This means the time has come to stop creating pages or content tailored to one keyword or keyword phrase. To maximize the effect, the semantic kernel of all targeted keywords, its variations, and related keywords must appear in the content with the same context as targeted keywords. 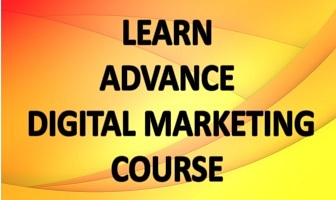 Want To Drive High Traffic To Your Blog? Follow These 10 Tips!